After our general audience with Pope Francis, we were just getting started. We had a very full afternoon and evening ahead. 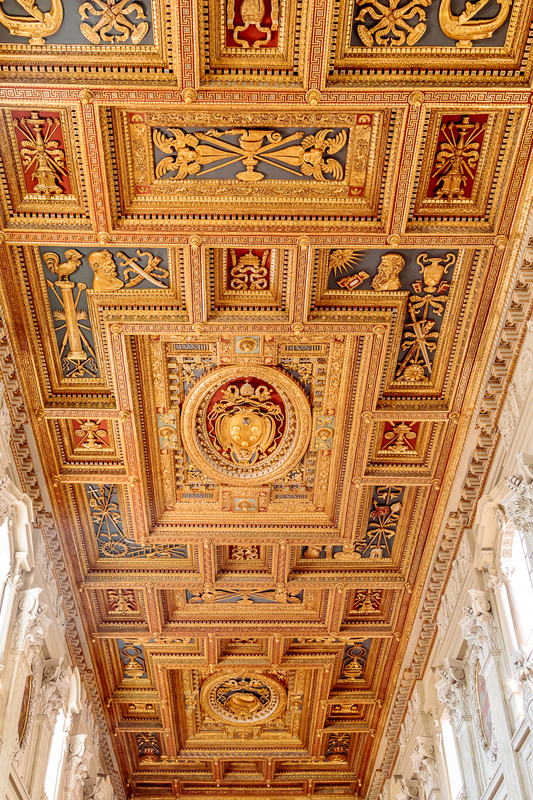 Next stop, Basilica di San Giovanni in Laterano (The Basilica of Saint John Lateran). 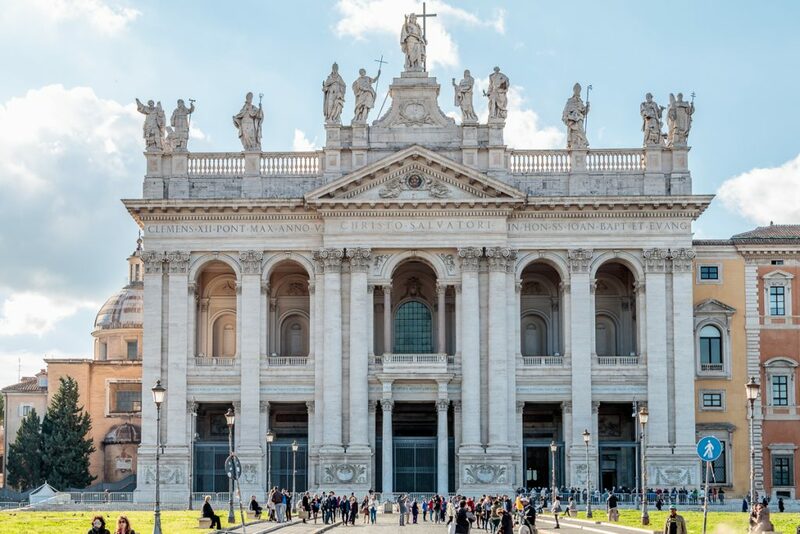 There are four major basilicas in Rome; Saint Peter’s, Saint John Lateran, Saint Mary Major, and Saint Paul Outside the Wall. 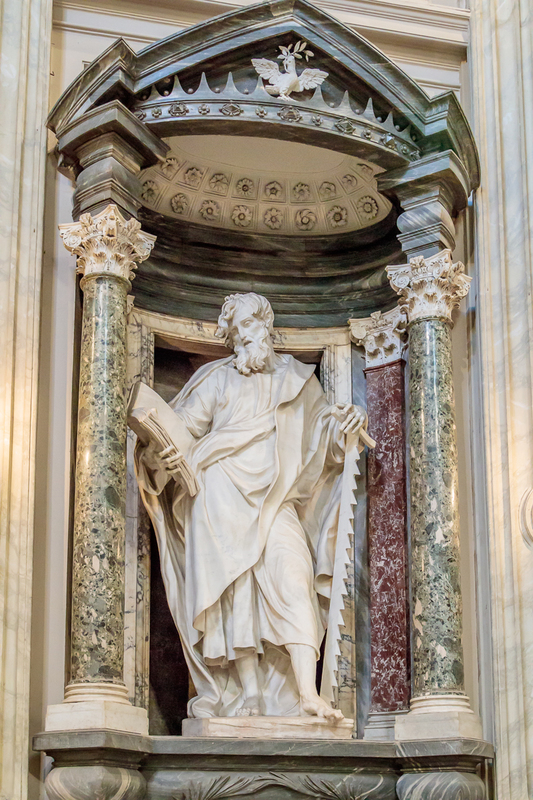 Although Saint Peter’s is usually thought of as the Pope’s church, this is not true. 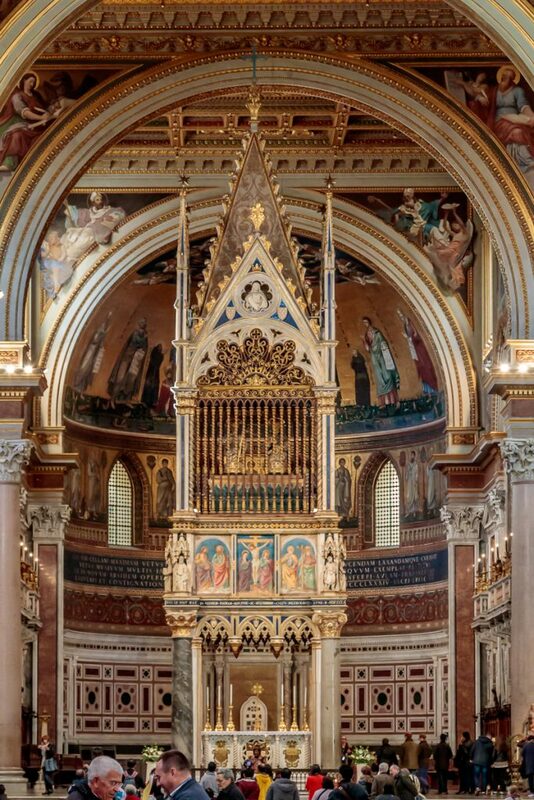 Rather it is Saint John Lateran. The large Latin inscription on the façade reads “Clemens XII Pont Max Anno V Christo Salvatori In Hon SS Ioan Bapt et Evang”, which is a highly abbreviated inscription which translates to “Pope Clement XII, in the fifth year [of his Pontificate], dedicated this building to Christ the Savior, in honor of Saints John the Baptist and John the Evangelist”. (Pope Clement XII was pope from 1730 – 1740.) 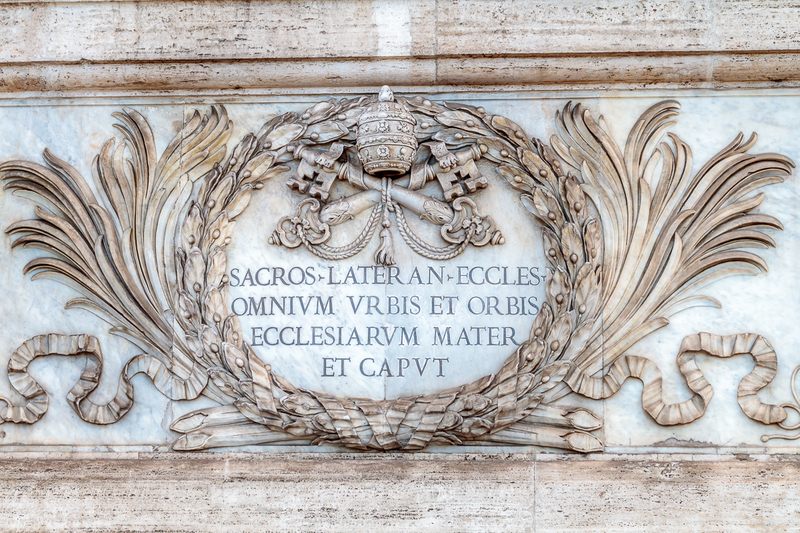 The inscription indicates, along with its full title, that the archbasilica was originally dedicated to Christ the Savior and, centuries later, co-dedicated to St. John the Baptist and St. John the Evangelist. Hence, the basilica’s full Latin name is “Archibasilica Sanctissimi Salvatoris et Sanctorum Iohannes Baptista et Evangelista in Laterano”, which in English is “Archbasilica of the Most Holy Savior and Saints John the Baptist and the Evangelist in the Lateran”. 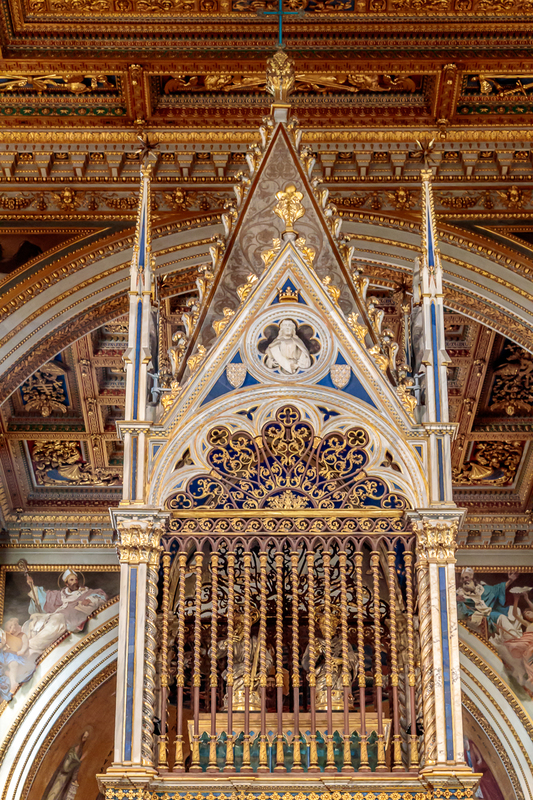 A bit of history – The area on which the basilica is built once belonged to the Lateran family. Their property was confiscated because they had conspired against Emperor Nero (Roman Emperor from 54 to 68), and had sheltered Christians in their home. 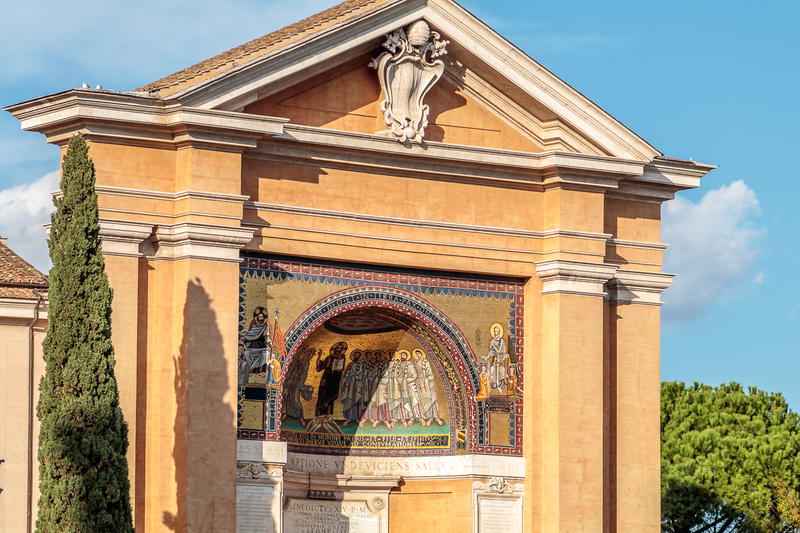 In the fourth century AD it was given by Emperor Constantine to the Pope, who built a church there. The popes lived here until 1309 when they moved to Avignon in France. 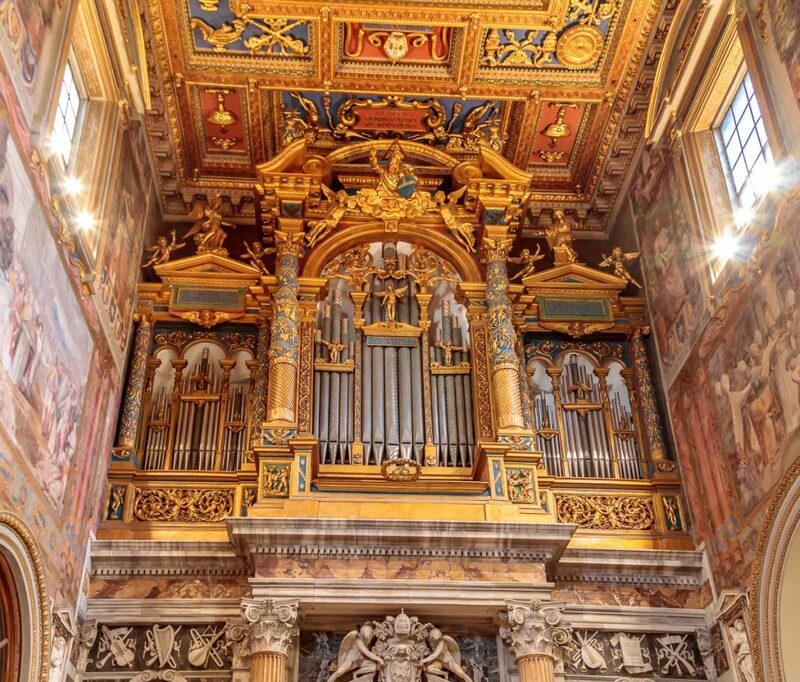 When they returned to Rome in 1377, the Lateran Palace was uninhabitable due to general decay so they moved to the Vatican. In the 16th century the ruins were taken down and this new church and palace was built. On the facade you can see 11 enormous statues, each 23 feet high. You can see Christ, John the Baptist, John the evangelist and various Church Fathers. 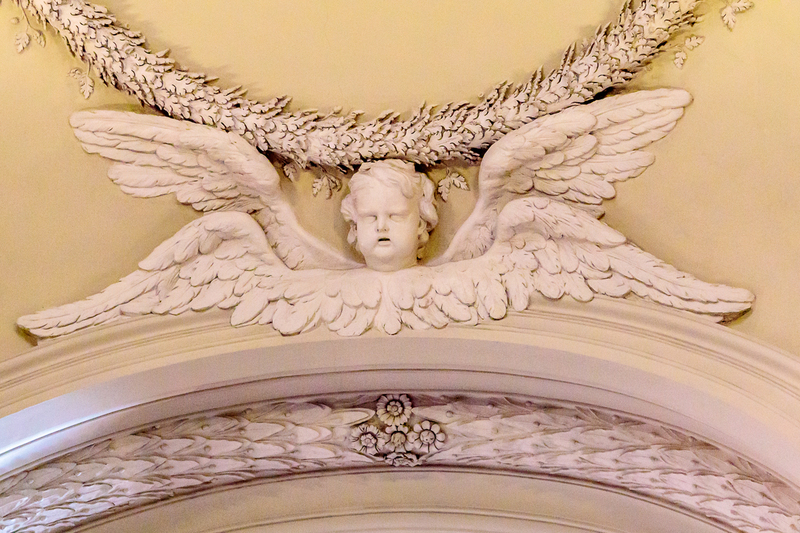 The facade was designed by Alessandro Galilei in 1735. Here are the central figures. 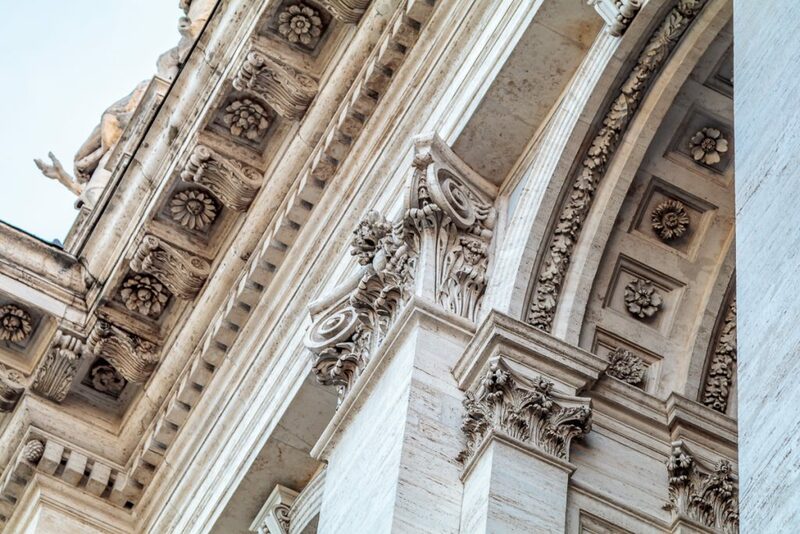 And, like the other grand basilicas, the exterior is quite ornate. The interior was designed in 1646 by a rival of Bernini, Francesco Borromini. 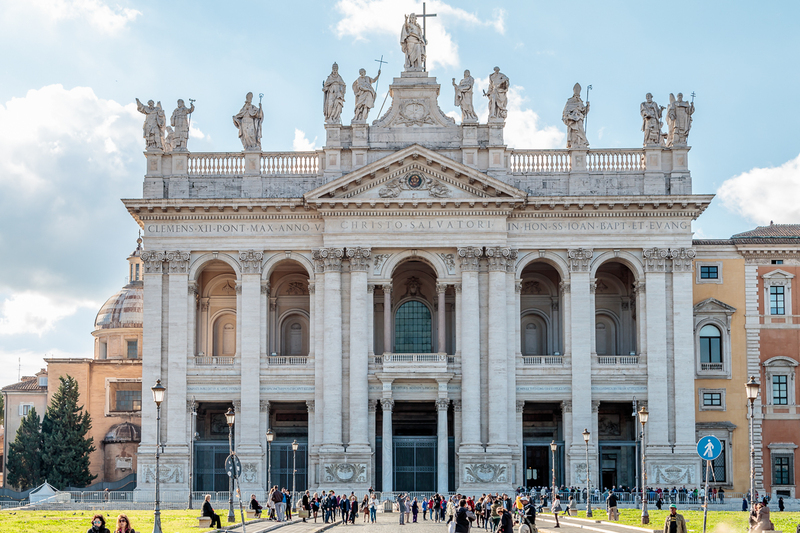 Next to the formal entrance is the archbasilica’s claim to be the head, or Mother Church, of the entire world. 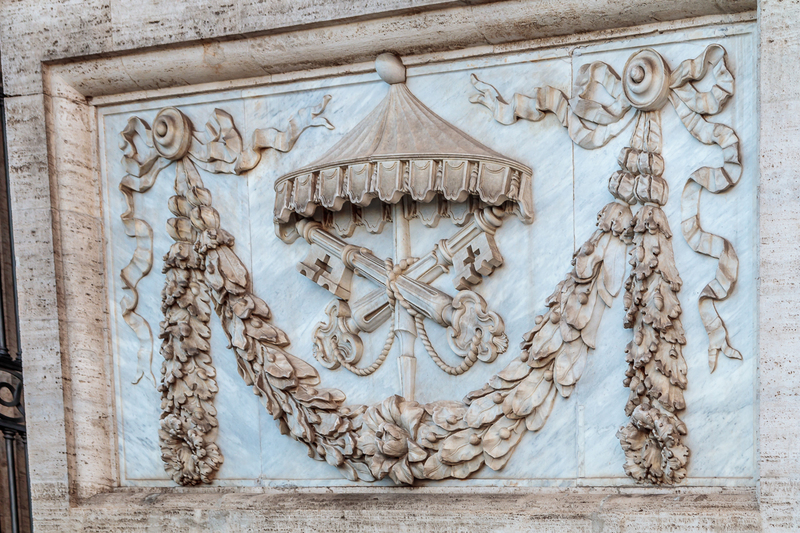 Note the laurel wreath and the Papal tiara. “Sacros Lateran Eccles Omnium Urbis et Orbis Ecclesiarum Mater et caput” or “Holy Lateran Church Mother and head of all churches of Rome and the world”. 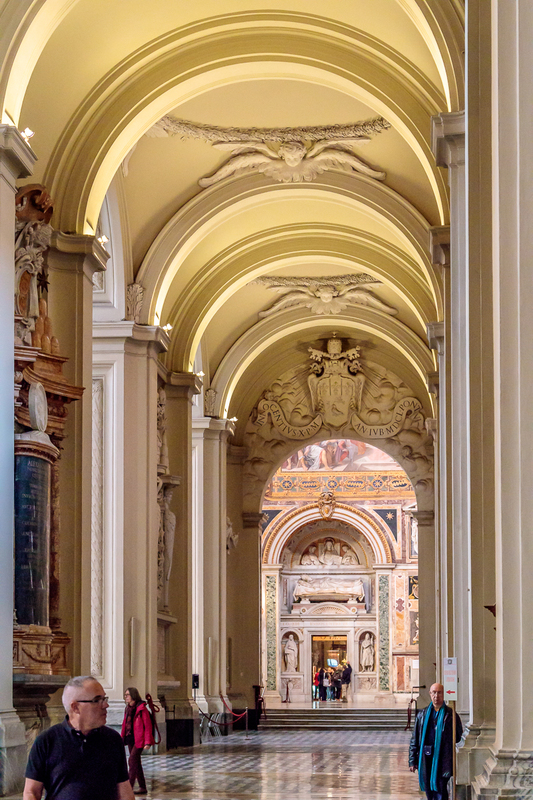 There were twelve niches created in Borromini’s architecture that were left vacant for decades. In 1702 Pope Clement XI and Benedetto Cardinal Pamphili, archpriests of the archbasilica, announced their grand scheme for twelve sculptures of the Apostles, of greater than life-size, to fill the niches. 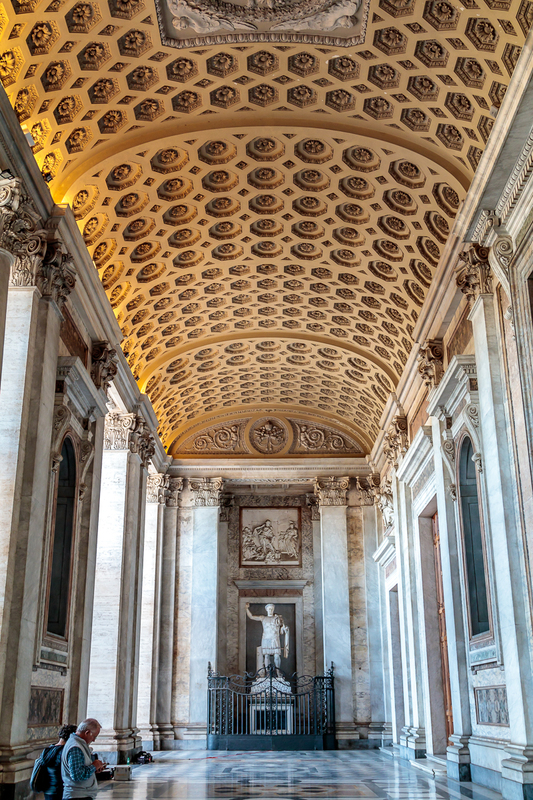 The commission was opened to all the premier sculptors of late Baroque Rome. Each statue was to be sponsored by an illustrious prince with the Pope himself sponsoring that of St. Peter and Cardinal Pamphili that of St. John the Evangelist. Here are three of them. 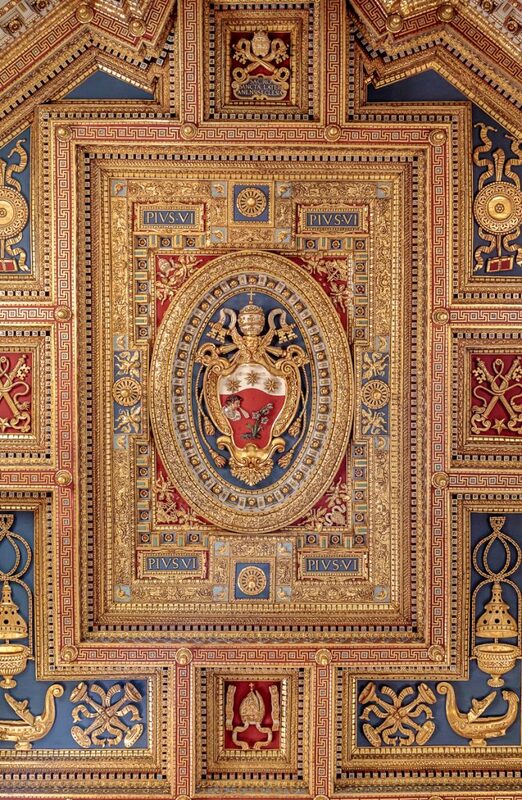 The coffered ceiling is from 1585. The baldacchino is from 1369. 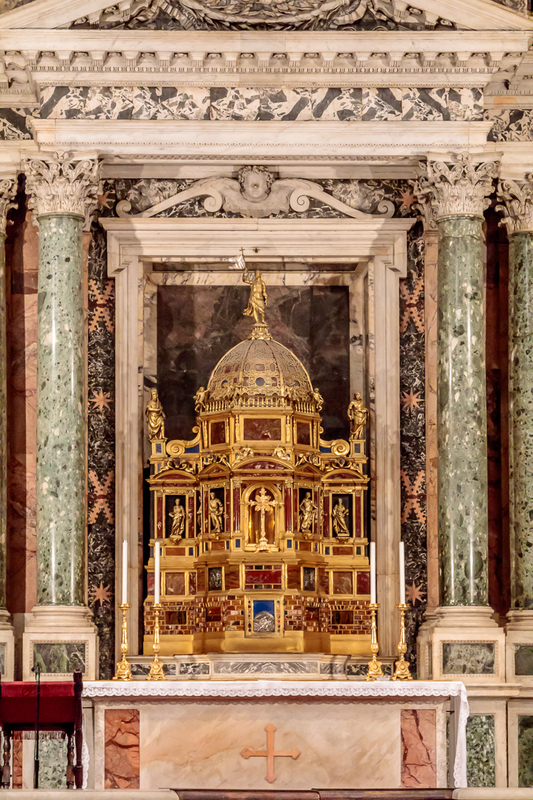 Beneath the baldacchino is the High Altar, which can only be used by the Pope. It contains a relic said to be part of St. Peter’s communion table. The heads of Saint Peter and Saint Paul are said to be kept in the silver busts behind the fence of the baldacchino, but they may have been moved during the French occupation of Rome in the 18th century. 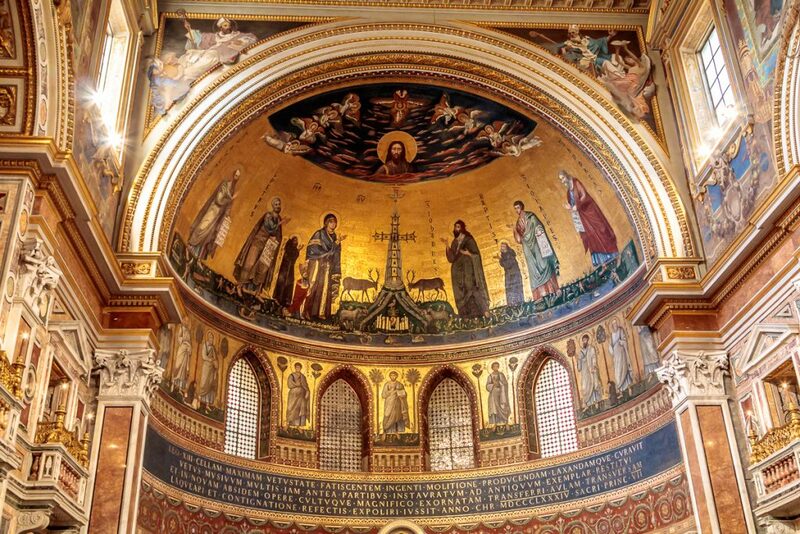 The top of the baldacchino contains 12 frescos from the 14 century. Above and behind the baldacchino is the mosaic apse. 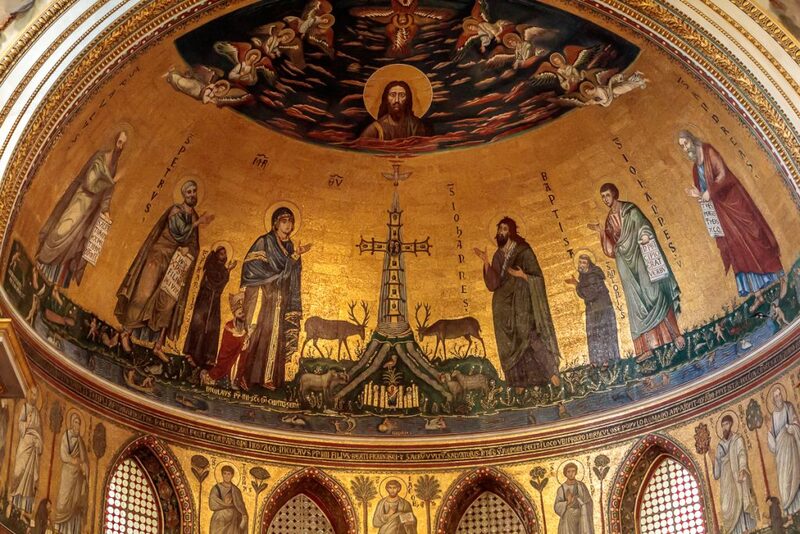 The mosaic in the apse represents Christ as a savior. It is from the 4th century and the first public representation of Christ. 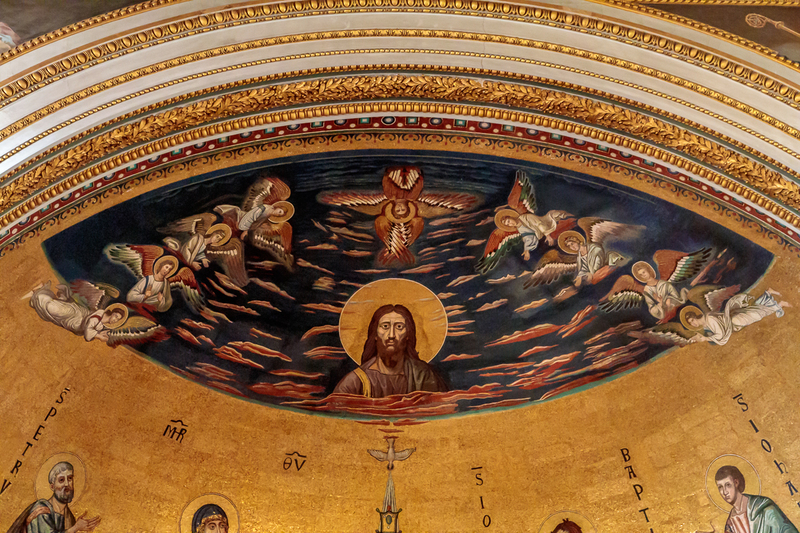 Legend has it the mosaic of Christ was made by angels. The rest of the mosaic is from the 13th century. 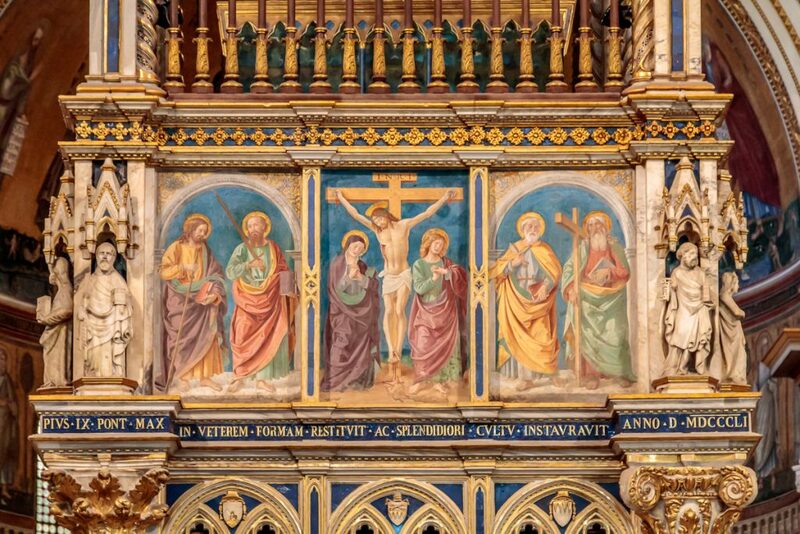 To the left of the cross you can see Mary, a pope, Saint Francis of Assisi, Peter and Paul. 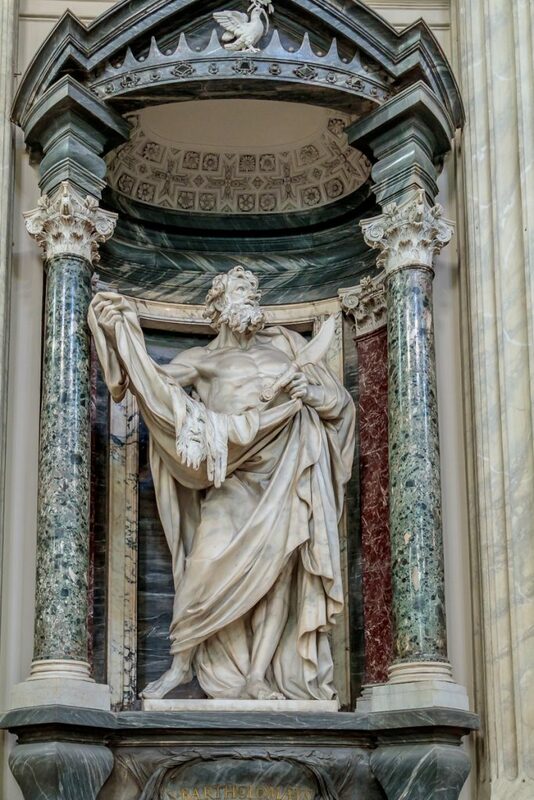 To the right you can see John the Baptist, Saint Anthony of Padova, John the evangelist and Andrew the apostle. 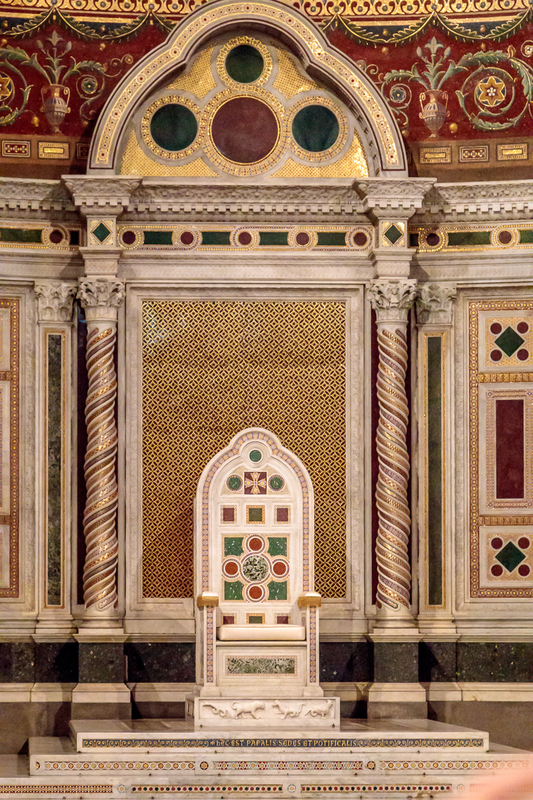 Below the Apse is the chair of the Bishop of Rome, the Pope. Located to the left of the Papal Altar is another very ancient table. This table rests above the Altar of the Holy Sacrament, the altar where the Blessed Sacrament is reserved. It is placed directly behind a bronze relief of the Last Supper. 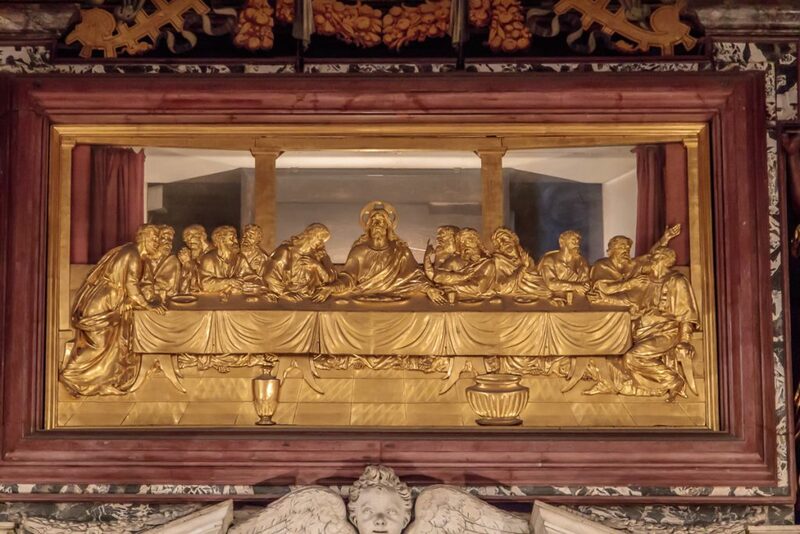 Tradition claims that it was upon this table that Jesus and the apostles celebrated the Last Supper. Let’s take a quick look at some of the other art treasures in this basilica. These are the pipes for the organ. 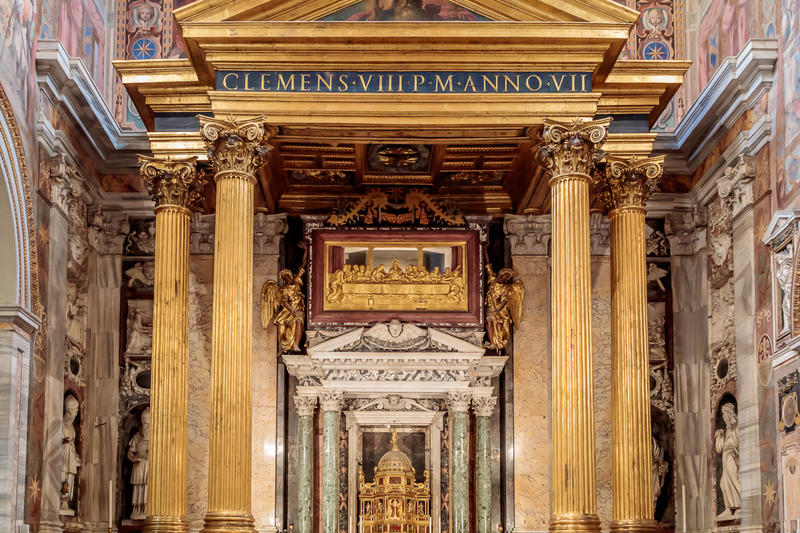 The monument and tomb to Leo XIII. Just outside the basilica is the Triclinium Leoninum, part of a 9th century room for banquets of the pope’s palace (the Lateran Palace). 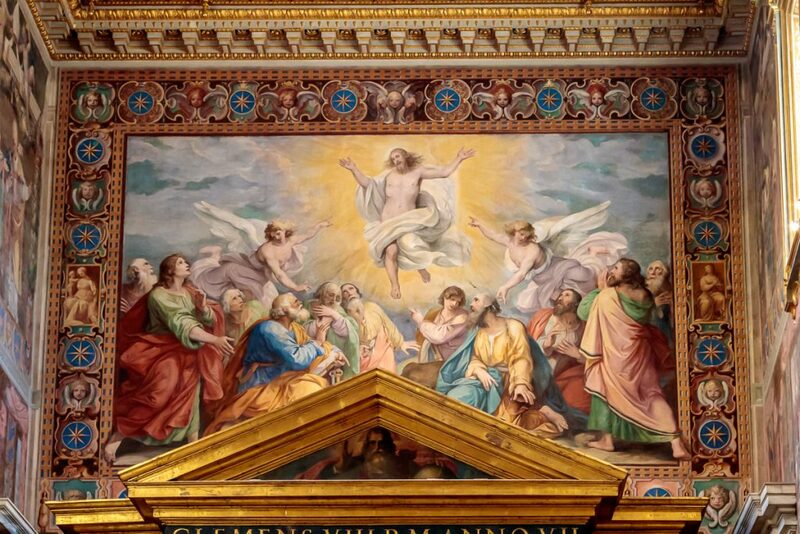 It depicts Christ with the Apostles in the center, Christ with Constantine and Pope Sylvester I on the left, and St Peter, Pope Leo III and Charlemagne on the right. 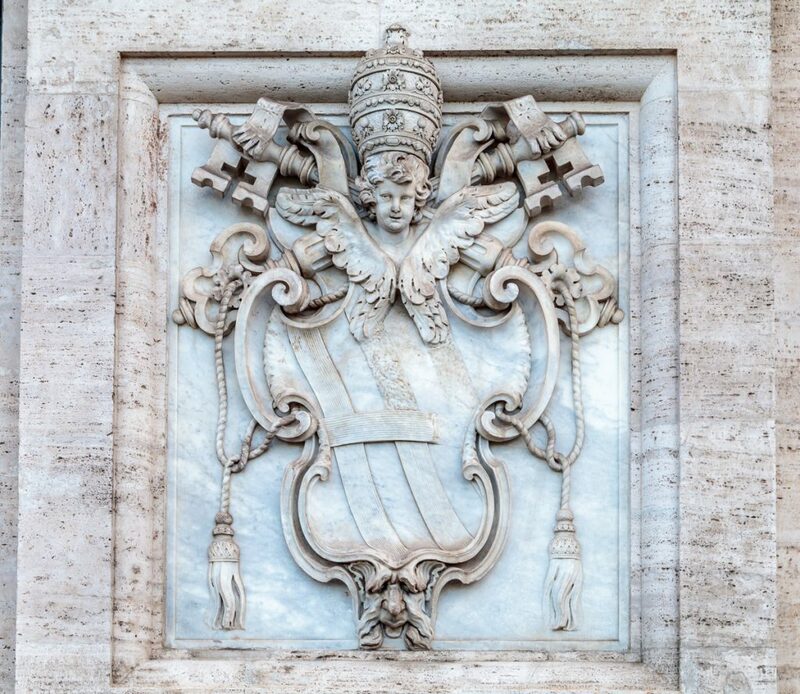 Pope Leo III has a square nimbus, showing that he was alive when it was made. 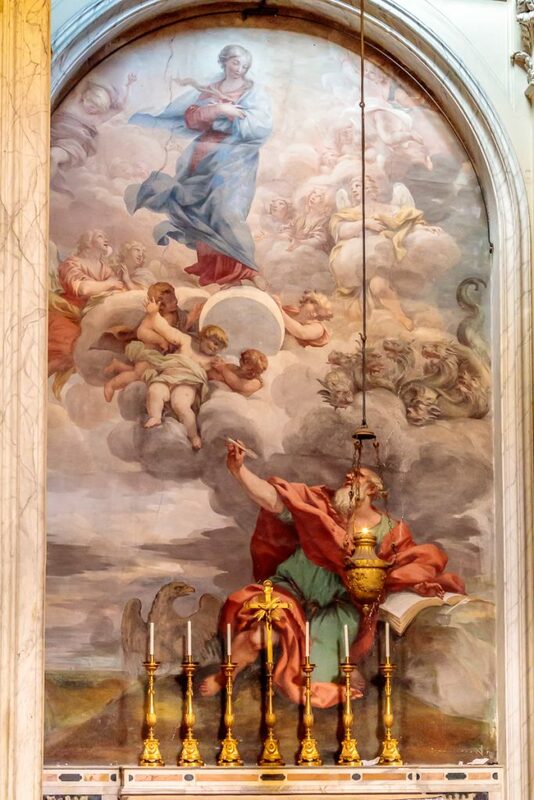 The original mosaic has been dated to just before year 800, when Charlemagne was crowned as emperor in Rome, but the present work is an 18th century copy. Another interesting sight just outside the basilica is a statue dedicated to St. Francis of Assisi. The Statue is a bronze sculptural group, the work of Giuseppe Tonnini. It was erected in 1927. 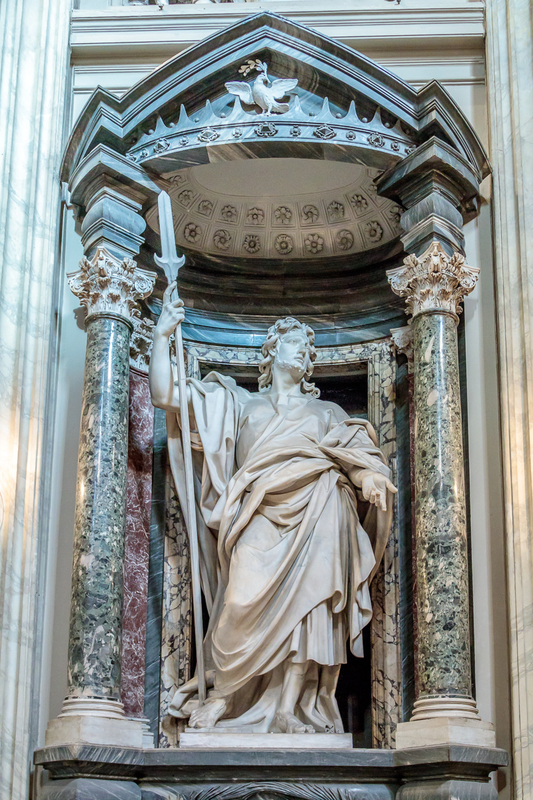 It is 23 feet tall and was made to celebrate the 700th anniversary of the saint’s death. 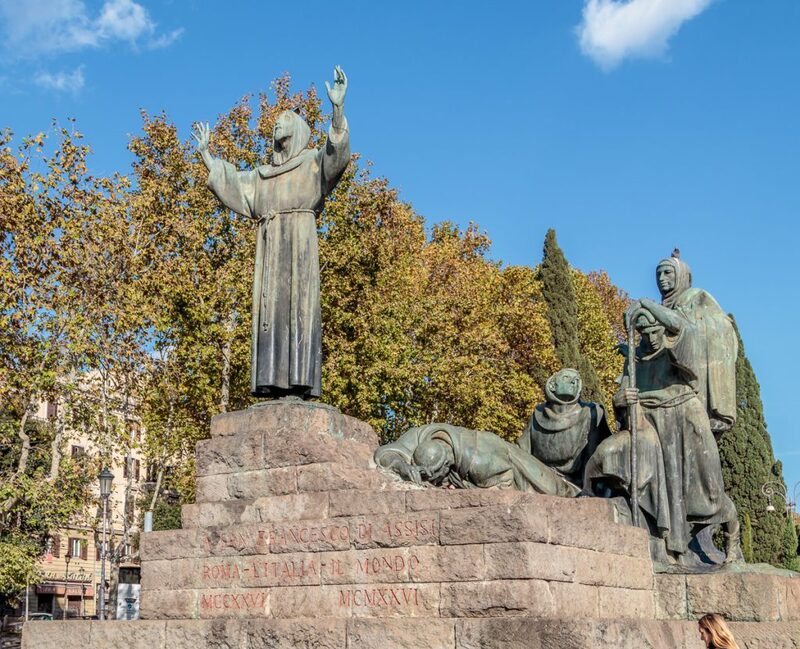 St Francis has his arms held out wide to symbolically embrace the Basilica of St. John while being surrounded by the bronze figures of his own disciples. 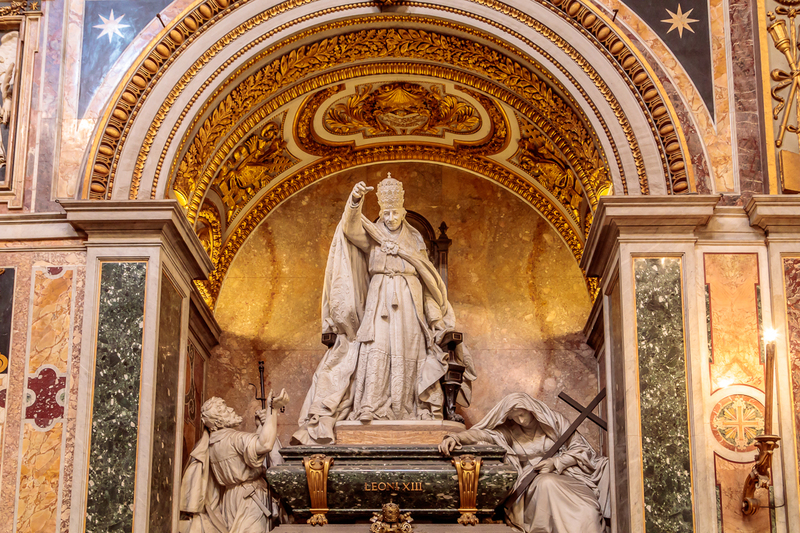 While Francis was in Rome to get the Holy Father’s approval for his Order, Pope Innocent III (1198-1216) saw in a dream that a man was supporting the basilica, which was on the verge of collapse. The next day, he met St Francis at the Lateran and recognized in him the saint sent by God to restore the church – not St John Lateran in particular, but the Church in general. 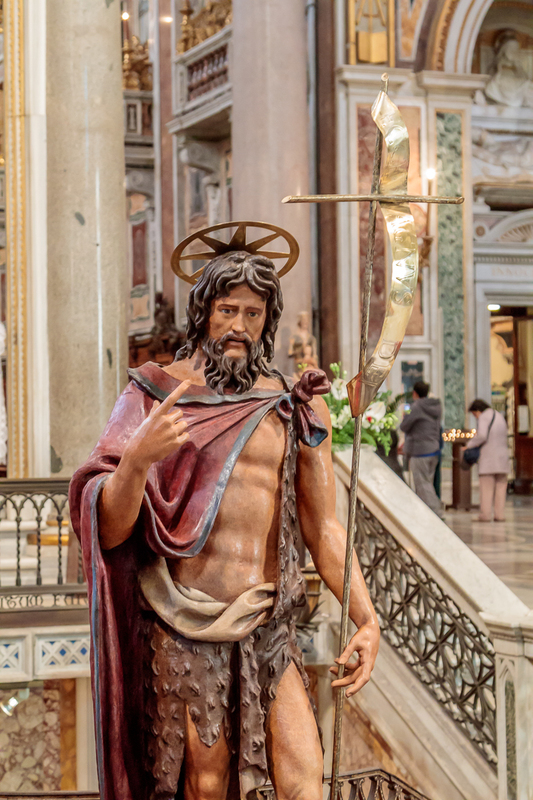 Although not seen in the photo below, there is a place behind the statue from which you get the appearance that Francis in the statue is supporting the basilica. 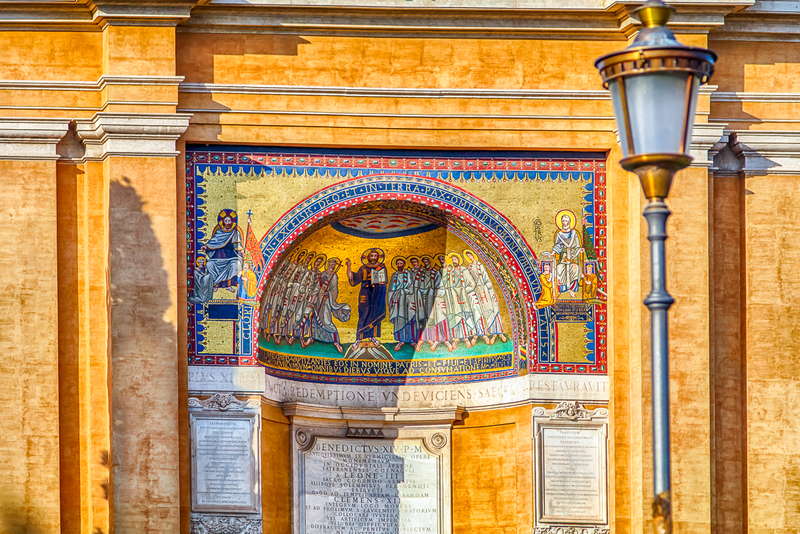 The inscription reads “A San Francesco di Assisi, Roma – L’Italia – Il Mondo, MCCXXVI – MCMXXVI” or “St. Francis of Assisi, Rome – Italy – The World, 1226 – 1926”. 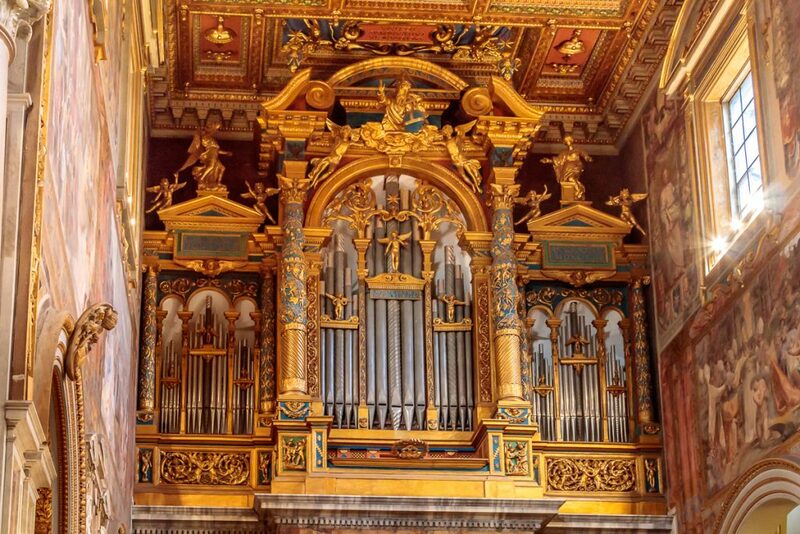 This concludes our tour of Basilica di San Giovanni in Laterano. 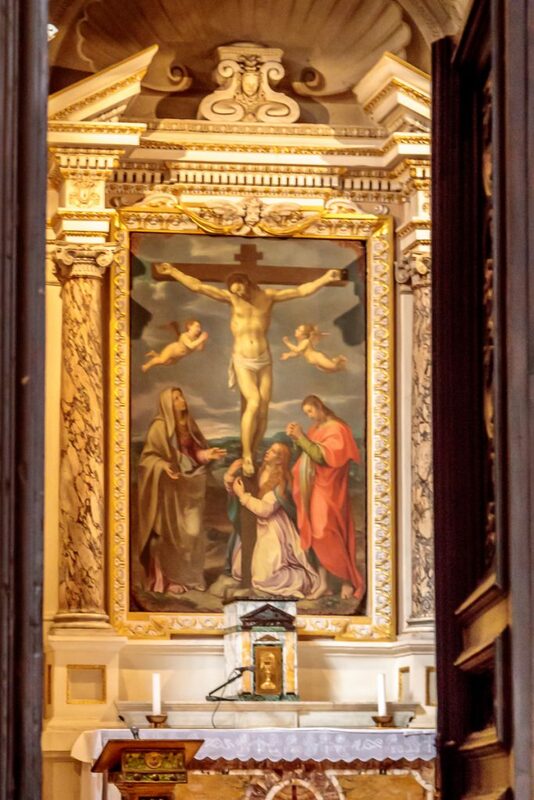 Next, we visit Basilica Santa Marie Maggiori. Facts were taken from WikiPedia and from Arend, Paul den. 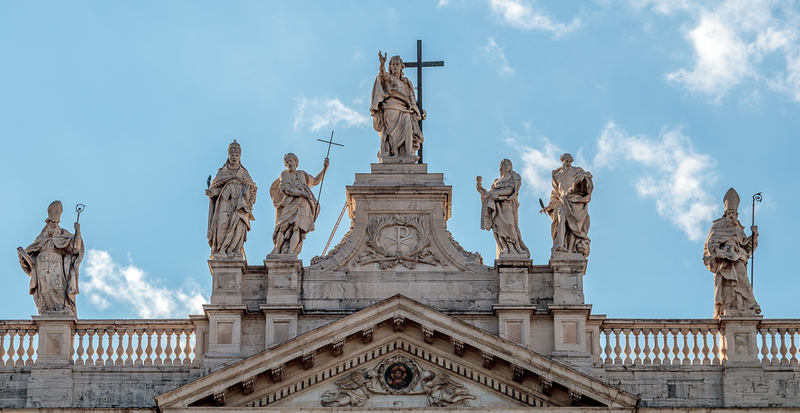 Complete Guide to the Vatican – Extended Edition: Including Saint Peter’s Basilica, the Vatican Museums, Sistine Chapel, Santa Maria Maggiore, St. Paul and St. John. Kindle Edition. This entry was posted in Travel and tagged Basilica di San Giovanni in Laterano, Church, Italy, Rome.